Our start to fulfill a dream of going down the intra-coastal waterway began on Friday, October 17, 2008 leaving Spring Cove Marina in Swan Creek just after sunrise about 7:25am. We had been preparing for months and the final full cockpit enclosure was completed by Victoria the week before we left. Thank heaven she completed it, because it has been wonderful on this exciting but chilly trip. We were hardly out of Rock Hall when Al’s favorite hat blew overboard. What a way to start a trip! However, we were successful in retrieving it and considered it a good man-overboard practice! We sailed as far as Herrington Harbor and then motored the rest of the way to the Solomons. We arrived around 5:30pm and anchored in Mill Creek. The next two days were spent in the Solomons due to high winds and a lot of fetch on the bay. We dinghied into town several times to enjoy some walking. We met a couple who asked us if we were boaters. We said yes, and they told us they were on a Catalina heading to Florida. We said we were also going to Florida to a marina in Stuart. They said dido for them. And, coincidently, they are going to the exact marina we are going for December and January, the Harborage Yacht Club and Marina. Small world, isn’t it? We are certainly glad that we got the enclosure for the cockpit, because when we arose Monday, Oct. 20th it was 43◦ when we left at 7:45am. 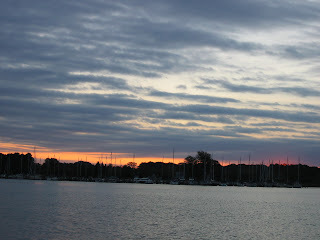 We have seen some wonderful sunrises because you must get up early to make headway If you want to get down the waterway quickly, which is our intent since it has been so chilly, we figure we will sightsee and go more slowly on our way back in the spring. Believe it or not, we were one of the last ones out of the creek and there were at least 25 boats out in front of us. We motor-sailed until lunch, then the wind died and motored until we made the turn to go into the Rappahanock. Then we sailed at 5 knots under jib alone. At the entrance a dolphin surfaced twice right near the boat. Of course, it would not surface again when I had a camera in hand! Earlier that day around the Potomac we already had seen pelicans which I thought was a bit more north than we have seen them in the past. We anchored in Godfrey Bay for a quiet night. Here at Tidewater we met a Canadian couple on another Bristol 41.1, named Estelle. They have been down the waterway 3 times, so we bent their ear about places to go and see. Another Bristol couple came over an offered to take us by car to the grocery store the next morning. We took them up on their offer and were off shortly after noon to catch the 1:00pm bridge opening. It was extremely windy around 25 knots gusting to 30 knots, so we were glad to be in the narrow channel of the intra-coastal waterway. Due to strong wind predictions for the next few days, we decided to go th e Dismal Swamp route. Jim and Jeannie on Estelle said going this route, you do not get the large power boats throwing their wakes or having to do slow passes all the time. We were glad that we followed their advice because we enjoyed the changing colors of the trees and the peacefulness of the swamp. We got to the first lock an hour before opening, so Estelle anchored and we tied on to her. We got through the lock with no problems learning that you do not throw your lines to the dock tender but place them on his boat hook. By the time we were through the lock it was 4:30pm, so we spent the night at the free dock there with the other seven boats that were in the lock with us. People gathered on the dock to exchange information and stories. We got a bit of walking in because there was a nice park next to the dock. Then we had drinks with Jim and Jeannie, dinner, and did some planning for the next few days. Since the bridge tender is the same person who is lock tender, we had to wait for the lock to open and then the bridge tender drives down to open the bridge. We left around 9:10am. With all the sailboats, we looked like ducks in a row going through the Dismal Swamp. Since it was so flat, and of course you have to motor since it is so narrow, I got my weight lifting routine accomplished that day. Some boats stopped at the Visitor’s Center but because we were trying to make time, we did not stop. Once again we wanted to make the 1:30pm lock opening which was accomplished. It felt good when we reached North Carolina around mile marker 25. Blue Heaven, Estelle and Lap Cat (a Nonsuch) anchored behind Goat Island for a very peaceful night. Up early Friday, Oct. 24th to see a spectacular sunrise and mist coming off the water. It was very mystical and magical! We made the 8:30am bridge opening at Elizabeth City and by 9:15am we had both sails up and going 5.6 knots. 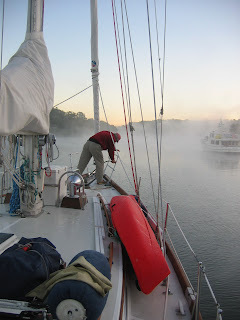 We sailed down the Pasquetank River, across the Abermarle sound and down the Alligator River all on one tack. Winds were 12 – 18 knots and we were going 5.9 to 7.5 knots. It was a great sailing day! We anchored at Tuckanoe Pt. north of the Alligator/Pungo Canal. We all agreed that it was the ugliest anchorage with dead trees and scrub bushes and swamp. The only reason we anchored there was so that we had a good start to get through the canal the next day. There were no other anchorages nearby. It blew quite a bit that night so we were glad to get into the flat waters of the canal on Saturday. We left around 8:30am and were through the canal by 12:30pm. Winds were blowing 22 -30 knots outside the canal so we motor-sailed partly and sailed partly across the Pungo River into Pungo Creek. We anchored off Windmill Point with the winds still blowing stink! They were up to 17 knots in the protected anchorage. Finally, around 4pm the winds died, the sun came out providing us with a beautiful evening to eat out in the cockpit. We were surprised to be able to get great reception for the Penn State/Ohio State game anchored out in the middle of no where. It was the end of another great day on the water when Penn State beat Ohio State on their own turf! Sunday dawned a beautiful sunny day and Blue Heaven left the anchorage around 7:40am before Estelle who don't tend to be as early risers as us. However, alot of other boats are early risers because it was like an armada going down the Pungo River. Once down the river we had to just motor due to wind direction crossing the Pamlico Sound and into the canal. We sailed and motored off an on down the Neuse River. We called ahead for slips at Oriental Marina for us and Estelle. That was a good move, because they do not have many slips and it was definitely the more protective marina. It was great to get a hot shower with complimentary towels at their bathrooms. Lots of cruisers stop there so it was a great place to talk to others who have experienced what we are doing for the first time. We went to the Inland Waterway Provisioning Co. where very friendly sales clerk offered her car for a grocery run the next morning. It is so great to know so many people are so generous to cruisers. We ate dinner with Jim and Jeannie from Estelle at the M & M Cafe and were not disappointed as the cruising books had recommended it. We discussed plans to go off shore from Cape Lookout to Wrightsville Beach. Jim and Jeannie were encouraging us to try it with them since they had experience, and we had both decided it would be a good time to try. We had wanted to take Blue Heaven in the ocean but had to abort our around Delmarva trip due to boat problems several years ago. Do we go or not, only time will tell!